Monica and I run in a once-a-month musically themed Thursday night series along the Charles River, a 5K that ends with a BBQ, band, and beer. 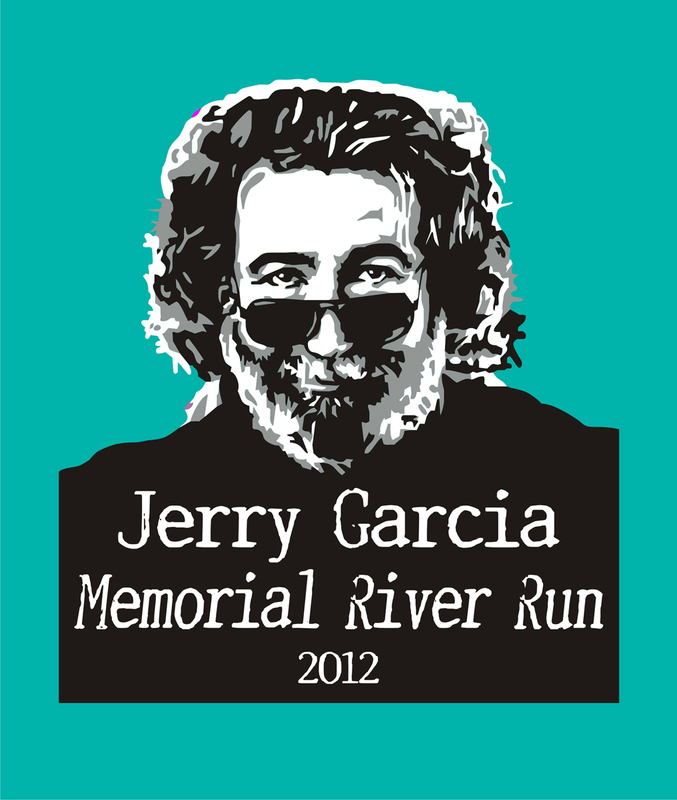 This month was the Jerry Garcia Memorial Run. The start/finish for this series is close to the house so it's easy logistically. Monica parked a car in the lot across the street earlier in the day and we road our bikes to the start. It didn't seems so hot at first, but as we arrived at the car it was clear that it was going to be a tough night. The humidity and lack of wind gave the scene a rather drastic feel. First, we changed into running shoes and pinned our bibs on, then headed over to pick up the t-shirt Monica had ordered. Runners were beginning to gather in greater numbers, so we walked around the tents to see what was there and dropped the shirt off back at the car. In just a quick jog across the road I could feel my hip bothering me, and I knew it wasn't going to be an easy race. At the starting line we stretched and did a quick warmup run to get the muscles moving. At 7:28 the massed runners surged toward the tunnel under the bridge and at 7:30 the race started right on time. This time the start was much more organized and orderly than the first race in the series. There was no mud, and less chaos so we were able to settle into a full speed pace quickly. As we made the turn at the sign and headed back to the tunnel everyone was already starting to sweat. Monica was running with her GPS watch and she said that it seemed to take forever to get to the first mile beep, but in fact we were well under 9:00 pace. This was the first 5K I've ever stopped to get water, it was just brutal. We crossed the bridge which is right around 2 miles and were headed back towards the finish line now, my hip wasn't bothering me as much as I expected and we kept up the sub-9:00 pace. We actually passed a few folks that had been ahead of us the whole way. At the turn into the finish line we handed our tickets to the collector, I said "Hi" to Jackie who I haven't seen in a long time, and we quickly headed for some water, food, and beer, in that order. On the beer line I kept feeling someone spilling what I thought was beer on my shoes. It was my own sweat dripping off my elbows. Yuk. The beer tasted great but it was really too hot to enjoy the food. The band was fine and I got to quickly catch up with Jackie and Christopher but we were both ready to head home. We were drenched with sweat even 45 minutes after we finished; thankfully Monica has waterproof seat covers in her car. Our time was great, around 26:15 which was about 3 minutes faster than last time. If the weather is cooler for the next two races it will be interesting to see our times improve.